Diversity Is Strength! It’s Also…The End Of McDonalds? McDonald’s shareholders watching their stocks dwindle in value received more bad news Monday, with the archetypal American corporation forced to report sales were down again, especially in the United States [McDonald’s Sales Slump Continues in May, ABC News, June 8, 2015]. Of course, this is the last time shareholders will enjoy the questionable benefit of knowing how poorly their company is performing, as McDonald’s will no longer report its monthly sales figures [McDonald’s US sales fall more than expected in May, by Akin Oyedele, Business Insider, June 8, 2015]. While corporate executives make vague promises about recovery, McDonald’s needs something more than a change in leadership or a new franchise model—it is failing because it put diversity over profitability, with unsafe restaurants located in dangerous neighborhoods, and values multiculturalism above competence. Thus, even as executives sheepishly admit their declining sales, McDonald’s continues to generate headlines for playing host to an endless series of beatings and assaults. Several “teens” were recently charged for the gang beating of a 43 year old man who had tried to break up a fight in a Brooklyn McDonald’s. The attack, which featured a mob screaming “Kill him right now!” was caught on video and has created international headlines [NYPD cops arrest 2 teens in Brooklyn McDonald’s brawl, by Thomas Tracy, Andy Mai, and Ben Kochman, May 17, 2015]. Luckily, the victim survived, but with severe injuries. In late April, a man was arrested for threatening people at a Nashville, TN McDonald’s with a machete [1 arrested for threatening man with machete at Nashville McDonald’s, News 2 Nashville, April 30, 2015]. And these are only some of the recent stories. Videos of people being beaten, robbed, or threatened at McDonald’s are almost as ubiquitous on YouTube as someone screaming “Worldstar!” before someone is knocked unconscious. Many of these cases are simply part of the endless wave of black-on-black violence gripping formerly First World American cities. As such, these crimes are utterly ignored. But in recent years two cases in particular have generated headlines—both group attacks of blacks against whites. In April 2011, Chrissy Lee Polis was beaten by two black women so severely that she suffered a seizure. Normally, of course, such a crime would be ignored, even though it was captured on video. However, because Polis was a “transgender woman,” the Main Stream Media covered it extensively [Woman sentenced to prison for beating transgender woman in McDonald’s, by Margaret Hartmann, Jezebel, September 13, 2011]. In 2014, Denton James Ward and Lauren Bailey Crisp died after an attack by a black mob at a McDonald’s in College Station near Texas A&M. Ward and Crisp were pronounced dead at the scene after an accident when a friend ran a red light trying to get Ward to a hospital. In the resulting lawsuit, lawyers for Ward’s family argued he died as a result of the beating. McDonald’s was ordered to pay $27 million to the two families [McDonald’s ordered to pay $27 million of Flower Mountain teen, friend following beating and fatal car wreck, by Karen Robinson-Jacobs, The Dallas Morning News, July 30, 2014]. These incidents cut to the core of McDonald’s corporate culture. Once seen as the all-American corporation, “McDonald’s” is now shorthand for a globalist mass culture that provides cheap, unhealthy food to lower-class people. McDonald’s is, quite literally, prolefeed. Part of this image was a deliberate choice by the corporation. It didn’t have to be this way. When McDonald’s aggressively expanded its McCafé line of coffee drinks in the United States in 2009, it was seen as a move to compete with Starbucks. Indeed, Forbes Magazine called it simply the latest successful tactic by a corporation long defined by its ability to sell a “lifestyle,” from the “American Way of Life” envied by foreigners in poorer countries to the “Fast and Convenient” approach young professionals wanted [Starbucks and McDonald’s Winning Strategy, by Panos Mourdoukoutas, April 25, 2013]. But McDonald’s also aggressively courted a reputation as a “diverse” company—most notably through its 365 Black campaign. 365 Black was an attempt by McDonald’s to show it was “deeply rooted in the community” by promoting black culture and offering awards, scholarships, and other benefits to African-Americans. Of course, this didn’t stop the campaign itself from being called racist, nor from discouraging lawsuits from customers who think the company is racist [The confusing case of McDonald's 365black.com, by Saya Weissman, Digiday, March 6, 2014]. More importantly, McDonalds defined “diversity” as a way to keep the company profitable. It boasted that “73 percent of McDonald’s total workforce” is composed of women and “people of color,” as well as 43 percent of all franchise staff and 55 percent of suppliers [McDonald’s Makes Diversity About the Bottom Line, by Aman Singh, Forbes Magazine, September 8, 2010]. In 2012, McDonald’s, with much fanfare, became one of the few Fortune 500 companies with a black CEO, Don Thompson. McDonald’s even has a “Chief Diversity Officer,” one Patricia Sowell Harris, hawking a jargon-heavy book entitled None of Us is As Good as All of Us: How McDonald’s Prospers by Embracing Inclusion and Diversity. Yet none of this actually helped the company make money. Thompson’s tenure, characterized by what the financial press delicately called “challenges,” came to a disappointing end after McDonald’s reported five consecutive quarters of declining sales [McDonald’s CEO exist erodes diversity among Fortune 500 execs, by John Kell, Forbes, January 29, 2015]. The new CEO admits the company has lost control of its brand [7 mistakes that led to McDonald’s downfall, by Hayley Peterson, Business Insider, May 4, 2015]. Most damningly, McDonald’s is confronting reports of declining customer service and even hostility directed towards customers from its non-white workforce [McDonald’s Tackles Repair of ‘Broken’ Service, by Julie Jargon, Wall Street Journal, April 10, 2013]. One of the more recent examples of vibrant cultural displays took place in Chicago: a McDonald’s employee attacked a customer and ruptured his eyeball after an argument at the register [Prosecutors: McDonald’s employee attacks customer, damaging man’s eye, by Geoff Ziezulewicz, Chicago Tribune, March 15, 2015]. Is there any good news for the Golden Arches? Actually, there is. Earnings overseas are powering what growth the company is enjoying, driven by healthier food and more customization options for customers [Where McDonald’s Can Look to For Signs of Hope, by Brian Sozzi, The Street, June 8, 2015]. As executives recognize this, the new corporate strategy centers on providing higher quality food—and, presumably, a higher quality of customer [McDonald’s Sales Top Estimates After Europe Outperforms U.S., by Craig Giammona, Bloomberg, June 8, 2015]. 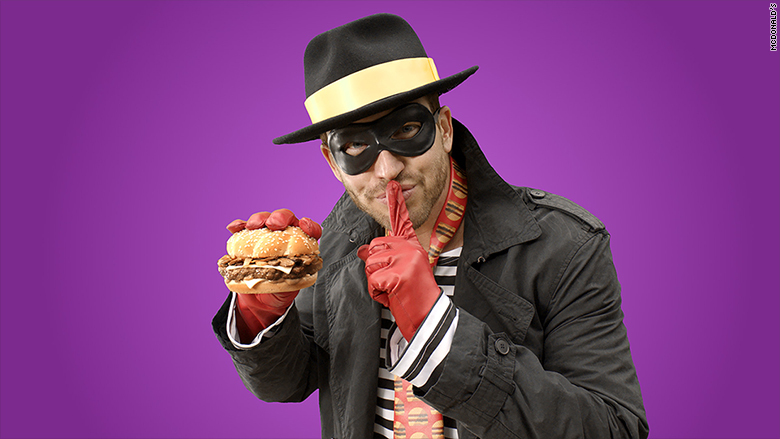 Even the Hamburglar looks like a hipster now. But this strategy is irreconcilable with 365 Black. And whatever its gains abroad, McDonald’s is increasingly seen as a “black” restaurant in the Land of the Free. And once a company, like a neighborhood, goes “black,” it’s hard to see how it can come back. In a culture defined by hypocrisy, McDonald’s forget the most important lesson successful white Americans need to know: Everyone says they love diversity —but only so they can make enough not to have to live with it.